Glandular tinctures are designed to stimulate the body into building a healthy organ by supplying an energy blueprint for healthy organ cells. Also helps alleviate symptoms caused by an ineffective organ. 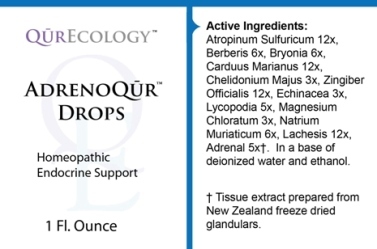 Active Ingredients: Atropinum Sulfuricum 12x, Berberis 6x, Bryonia 6x, Carduus Marianus 12x, Chelidonium Majus 3x, Zingiber Officialis 12x, Echinacea 3x, Lycopodia 5x, Magnesium Chloratum 3x, Natrum Muriaticum 6x, Lachesis 12x. Recommendation: Take 15 drops three times a day or as directed by a health care professional.